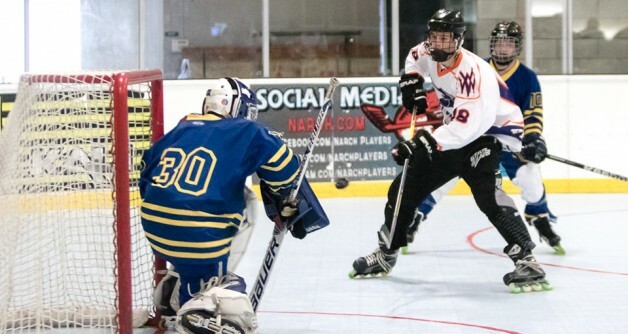 The Western Collegiate Roller Hockey League (WCRHL) held its annual kickoff event on Oct. 24-25 at San Jose’s Silver Creek Sportsplex. Twenty of the 25 teams slated to play in 2015-16 saw action during the two-day tournament. Teams had a chance to match up against squads from their own division as well as other competition tiers. WCRHL director Brennan Edwards said to expect some changes in the final order of place-finishes from last season. Cal Poly defeated Arizona State, 6-4, to win last year’s WCRHL regional championship title before going on to post a Final Four place-finish, along with UNLV, at the ensuing National Collegiate Roller Hockey Association championship tournament in Missouri. UNLV did indeed get off to a strong start at October’s San Jose event by winning all four of its games against fellow Division I rivals. The Rollin’ Rebels shut out Long Beach State, 6-0, then bested Arizona State, 7-3, before topping UC Santa Barbara, 9-1, and Cal Poly, 8-5. Arizona State finished 3-1 with its lone loss to UNLV, while UC Santa Barbara, Long Beach State and Cal Poly each picked up one win in the season-opening tournament. UNLV’s Andrew Tamura paced the division in scoring with nine goals and 13 points in the four games, while ASU’s Ryan Cotton collected six goals and 12 points. UNLV’s Darren Corsatea (four goals, seven assists) and UC Santa Barbara’s Kyle Mooney (four goals, seven assists) each followed with 11 points, while UNLV’s Austin Shannon (four goals, six assists) rounded out the division’s top point-getters with 10. Cal Poly’s Daniel Kumata and Long Beach State’s Shin Yamamoto each scored six goals to lead their respective teams, while UNLV’s Eddie Davis contributed five goals to the Rollin’ Rebels 4-0 start. Tamura led Division I scorers with three game-winning goals. Goaltending leaders included UNLV’s Terry Martin (2.25 goals-against average, .888 save percentage) and ASU’s Braxton Schulz (4.50 goals-against average, .841 save percentage). Terry picked up four wins, while Schulz posted three victories between the pipes. Long Beach State’s Tyler Gealy turned in a .727 save percentage, while UCSB’s Colin Menz posted a .721 save percentage and Cal Poly’s Matthew Dodds recorded a .707 save percentage. Long Beach State’s Nick Gonzalez registered a 5.00 goals-against average in two appearances. UC San Diego posted a runaway 15-1 regular-season record to top Division II teams last season, though UC Irvine won the regional championship title with a 6-5 overtime decision over UC Santa Cruz. Both UC Irvine and UC San Diego advanced to the semifinals at last season’s national championship tournament. Chico State (3-0-1) and CSU Fullerton (3-1) led the parade of Division II teams with top showings at the San Jose showcase, while UC San Diego finished 2-1-1 and UC Irvine went 2-2. Cal-Berkeley (1-3) posted one win while UC Santa Cruz (0-4) failed to pick up a point. UC Irvine’s Andy Trinh (six goals, 11 assists) led Division II scorers with 17 points, followed by Anteaters teammate Rishad Dalai (nine goals, seven assists) with 16 and UC San Diego’s Dylan Shives (10 goals, four assists) with 14. Shives had the most goals in the regular-season opener, while Trinh topped the division in assists. UC Irvine’s Isaac Magness and Fullerton’s Kiefer Lupascu each notched two game-winning goals. Chico State netminder Michael Wood posted three victories in four games to lead the division with a 2.31 goals-against average and a .870 save percentage. Fullerton’s Ron Best, just 17, notched three wins, while UC San Diego’s Peter Simonsen posted a 3.64 goals-against average and a .817 save percentage in grabbing two wins at the season-opening event. ASU’s Maroon and Black teams each won all four of their games to begin the season as Division III co-leaders, while Sonoma State (Division IV) finished 2-1-1. West Valley University, entered in the Junior College division, turned in a strong showing with three wins against Division II teams. Tyler Gulan led West Valley with seven goals and 13 points, while goaltenders Jack Robinson (2.00 goals-against average, .857 save percentage) and Nicholas Swanson (4.71 goals-against average, .792 save percentage) split the four games in the net, with Robinson picking up two wins and Swanson one. Alex Shearin racked up 12 goals and 19 points to lead Sonoma State in scoring, while teammate Chase Watson posted a .823 save percentage in going 2-2 between the pipes. ASU Black’s Jordan Foret paced Division III scorers with 13 goals and 20 points. The next WCRHL regular-season event is scheduled for Nov. 21-22 at The Rinks-Huntington Beach Inline. Teams in all divisions will participate, including newcomer Cal Poly Pomona in Division II.